I purchased this old revolver a few years ago from a seller who had acquired it in a Civil War collection he had purchased. The Civil war collection came from a friend of the seller who was a caregiver for an elderly women who had passed away. The collection had presumably belonged to her late husband. Several expensive and authentic items were included in the collection. 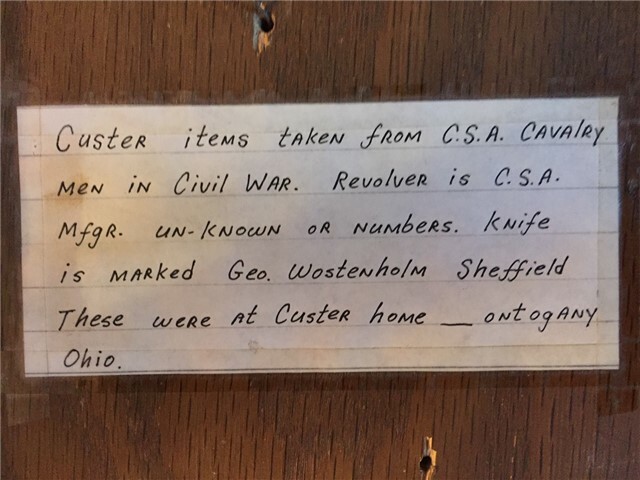 "Custer items taken from C.S.A. Cavalry Men in Civil War. Revolver is a C.S.A. Mfgr. unknown or numbers. Knife is marked Geo. Wostenholm Sheffield. These were at Custer Home Tontogany, Ohio." The writing on the front was worn off and barely legible but someone had re-written it on an index card on the back of the plaque. 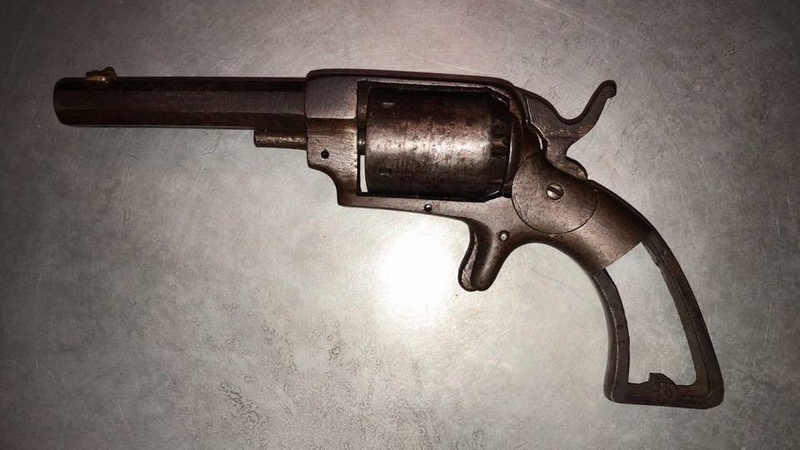 The pistol make and age was not easy to identify as there are no clear markings. The previous owner believed it to be a Confederate Spur pistol taken from a rebel soldier and brought home as a souvenir or possibly a gift for a family member. The entire collection had been appraised with some extremely high ticket items included but they had difficulties authenticating that pistol. 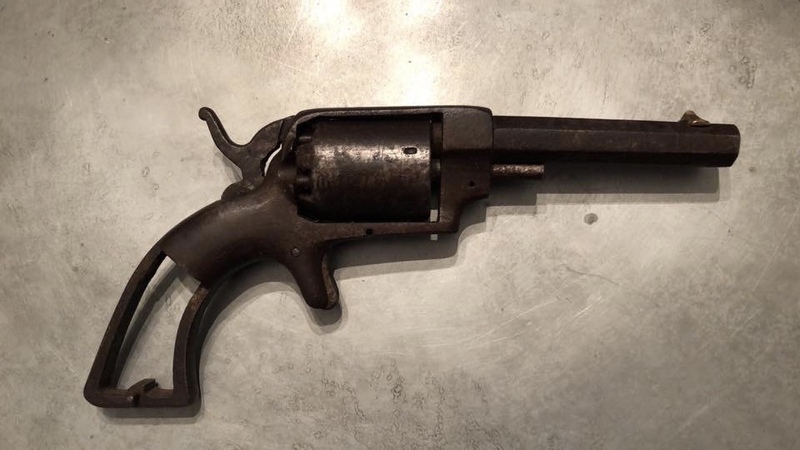 After some research and consulting with some members of an antique gun collectors forum I was able to identify it as an Allen and Wheelock Providence Police Model (see below). 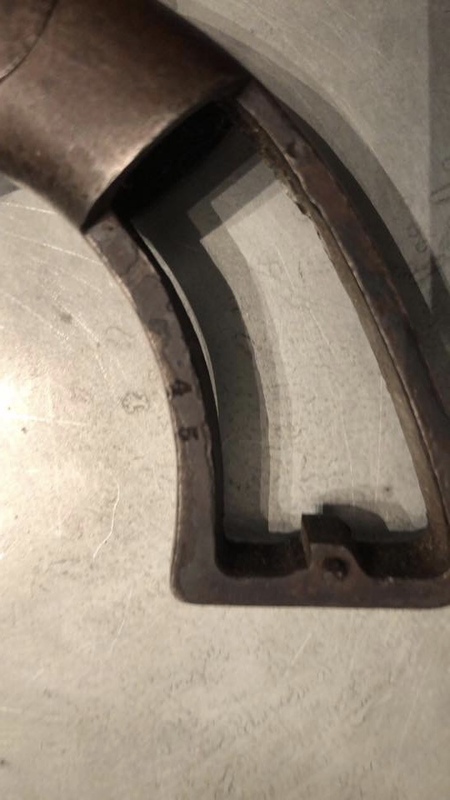 I was also able to locate what appears to be a serial number of "45" stamped into the grip frame. This model is an anomaly which has bedeviled collectors for years. It is unmarked, but has some distinctive design features patented by Allen. It is a five-shot .36 caliber weapon with samples including 3, 4 and 5 inch barrels. It is a bit of a throwback, without a loading lever and sporting a spur trigger. Known examples had a blue finish and wood grips. There are records indicating purchase by the Providence Rhode Island police department, hence the name commonly attributed to this model. It is possible that this was a specific contract, and the model was never marketed to the public. This may indicate production very late into the E Allen and Company era shortly before Allen's death. 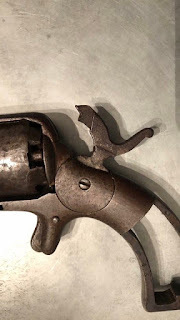 His sons-in-law Forehand and Wadsworth may have deemed an obsolescent percussion pistol unworthy of bringing into the inventory of the company now sporting their names, and discontinued the model after that initial run. 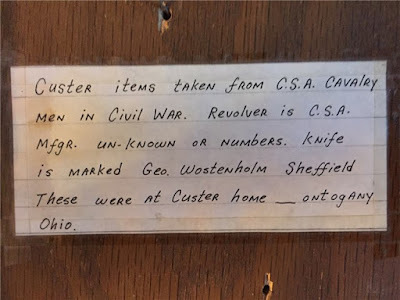 After further research I was also able to find some information on the Tontogany Custer homestead including the following which is written on a historical marker in the town of Tontogany. "Near this site stood the former Custer Homestead of Emanuel and Maria Custer from 1856-1865. For two years it was the boyhood home of Captain Tom Custer, younger brother of famed General George Armstrong Custer. At age 16, Tom misled a recruiter in neighboring Gilead, Ohio about his age and enlisted in the Civil War. He later earned two Congressional Medals of Honor, the first person in history to do so, for capturing enemy flags at Namozine Church on April 3, 1865 and at Sailor's Creek on April 6, 1865. His parents relocated to Monroe, Michigan during the Civil War. Tom continued serving in the Army during the Indian Wars in the West and often visited his brother Nevin in Tontogany. He, along with his brothers George and Boston, brother-in-law James Calhoun, and nephew Harry Reed, were killed at the Battle of the Little Bighorn in June 1876." 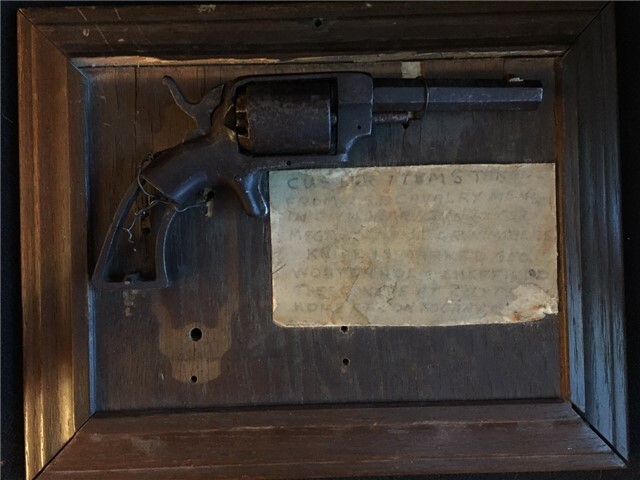 My research continues on this pistol and I have been in touch with one of the foremost experts on General Custer who has confirmed that there was an auction of items from the Tontogany home some time ago. This was the collection of the late Colonel Vietzen of Lorain, Ohio which was auctioned off by his widow. I am not sure yet if this item was included in that collection. It was confirmed that there is a good possibility that this item and the story attached may be genuine. My search for a positive link continues. I am also attempting to locate the knife that went with the plaque as well as a set of grips that would fit the pistol. Any information can be left in the comment section below and would be greatly appreciated.